This new, bigger, 10.5-inch iPad Air will arrive with a 70 percent performance boost compared to its predecessor, thanks to the Apple's A12 Bionic chip with Neural Engine. That will be useful together with the now 20-percent larger display which is compatible with the first-gen Apple Pencil too. 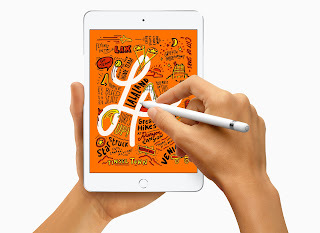 A new iPad Mini has been a long time coming. The 7.9-inch option will, barring screen size, match the Air on specs. The screen is also 25 percent brighter versus old iPad minis, and will also support Apple Pencil; the slimmest model to do so. The two new iPads have a laminated display that brings the surface glass and screen closer together to improve visibility, and making them at least a little more attractive than Apple's entry-level iPad. Neither of them has FaceID built-in, See image of the new iPad Air below.